Having a good hair day doesn’t just happen by chance. It happens when taking care of your hair becomes just as important as taking care of your skin. But what do you do when your hair has been damaged by every day styling, and chemical processing, dyeing or perming? Is there any solution for fly-away hair, dullness and faded color? Understanding how hair damage can occur is the best defense against both preventing it and repairing it. Can you repair damaged hair? The cuticle is the outer layer of protective scales. It is the main hair structure and is responsible for the strength, shine, smoothness, softness and manageability of healthy hair. The cuticle can be damaged by chemical or mechanical means, such as dyeing or blow-drying. The cortex provides strength to the hair shaft, and determines the color and texture of hair. The medulla is the innermost core of the hair where the body and strength of the hair is determined. There is also a layer of sebum, an oily substance secreted by the hair follicles, which coats the cuticles and adds shine and manageability to the hair. Environmental factors, such as exposure to sunlight, air pollution, wind, seawater and chlorinated swimming pool water can also cause damage to occur. How do you make your hair shine? Shiny hair has always been equated with healthy hair, even though the health of a hair follicle cannot be determined due to its location deep within the scalp. The shine is due to light reflected by the smooth surface of the individual hair shafts. Conditioners containing polymer film-forming agents can increase hair shine by helping the cuticle “scales” lie flat against the hair shaft for a smoother appearance. Another thing to watch out for is static electricity. Combing or brushing the hair allows the individual hair shaft to become negatively charged, creating static electricity and preventing the hair from lying smoothly in a given style. 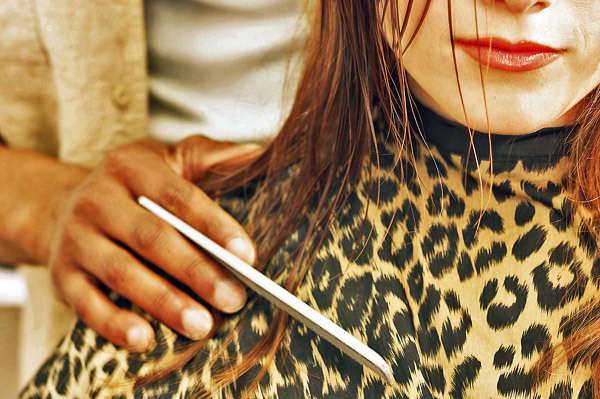 Fine hair is more susceptible to static electricity than coarse hair due to the greater surface area of the cuticle. Conditioners with the ingredient quaternary ammonium can minimize static electricity by imparting cationic properties, or positively charged ions, to the hair to neutralize the static. How can you get stronger hair? Increasing the hairs’ strength can be attempted by using conditioners with ingredients such as hydrolyzed proteins or hydrolyzed human hair keratin proteins, which have a low molecular weight. They can easily penetrate the hair shaft to replenish the hairs nutrients, providing a high degree of improvement. These proteins can also be used to smooth down split ends, also known as trichoptilosis. “Split ends develop after the protective cuticle has been stripped away from the end of hair fibers as a result of chemical or physical trauma,” says Dr Draelos, “but it can also be a result of vigorous brushing.” While there is no way to reverse split ends, trims every four weeks and deep-conditioning treatments can keep strands supple and flexible. While the hair is made up of nonliving materials and cannot develop cancerous qualities, its cosmetic value can be diminished through excessive exposure to the sun. UV exposure can induce oxidation of the sulfur molecules within the hair shaft, which are important for hair strength. If this oxidation occurs, the hair can become weak, dry, rough, faded and brittle. Individuals who bleach or lighten their natural hair color may also notice slight color changes in their hair when it is exposed to UV rays. Blonde hair may develop “photoyellowing,” a process where chemicals in the hair shaft react to UV exposure, causing yellowing, fading and a dull appearance. Even natural brunette hair tends to develop reddish hues due to the photo-oxidation of melanin pigments in the hair shaft. To protect your hair from the damaging rays of the sun, look for a leave-in conditioner that contains zinc oxide. Wearing a hat made of a solid material is another form of protection. When selecting a hat for sun protection choose carefully. Some hats, which may be fashionable and look nice, have open spaces, especially straw hats, which cannot give you much protection.